If you’re looking for a precision welding process, you might want to consider pulse welding. Not only does the process produce attractive welds, but also it can help with avoiding common welding discontinuities and defects. 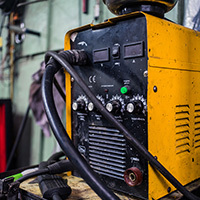 Pulse welding is a variation on two core processes commonly taught in a welding training program: gas metal arc welding (MIG) and gas tungsten arc welding (TIG). Learn more about pulse welding and when to use it with the MIG or TIG processes in this article. What Is Pulsed Arc Welding? Electric arc welding processes typically rely on a consistent current or voltage to maintain the arc and heat the metals. The welding current is measured in amps and the voltage in volts. Pulse welding is different because the current continuously fluctuates from low to high. With pulse TIG welding, the operator would still control the amperage output with a foot pedal, but the amperage output from the TIG torch is a pulsed waveform instead of a steady stream of electrical current. If you were to plot the variations in the electrical current on a graph, the resulting image would be the shape of multiple waves. 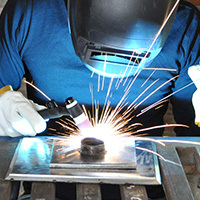 In pulse MIG welding, the current is also varied. The technique was first introduced to improve the control over metal transfer when using currents at low average levels. It relies on directing quick, high-current pulses at the work. The result is a process in which the filler metal is transferred from the electrode to the weld puddle without contact. The electrode never touches the work. One droplet of molten metal is formed at the end of the electrode per each pulse. When the current peaks, the droplet is pushed across the arc into the puddle. One droplet is delivered per pulse. There are several instances where pulse welding can improve the precision and appearance of your welding, as well as help you avoid welding mistakes or defects. When joints are located out of position and difficult to reach, pulse welding can produce cleaner welds. The base metal can congeal to the weld puddle during the trough in current preventing it from dripping out of the joint. Pulse welding on thin metals reduces the risk of burn through. Setting the frequency of the pulse to one or lower and manually feeding the welding electrode in tandem can produce visually appealing work. For projects that weld aluminum or other nonferrous metals, pulsed welding can lower the overall heat generated while working. When the current cycles to high during pulse welding, the operator can achieve deeper penetration welds. Due to the low cycles, however, the overall heat produced can be lower. Lower level of fumes compared to other modes of transfer. Under certain circumstances, pulse welding can offer an advantage over straight MIG or TIG welding. These fundamental processes are typically taught in welding school, so students who want to build on these skills can learn the variation of pulse welding. Expanding one’s skillset can often offer a competitive advantage in the job market. Welding has all kinds of different tools and techniques. Learn what oxy-fuel cutting is all about.